There is not a whole lot that Google doesn't have a hand in these days, when it comes to personal technology, at least. The tech giant already had a router in OnHub, but they just upped the home wireless ante with their new Google Wifi. The reviews are in -- here is what everyone is saying about Google's latest. In IT Blogwatch, we are connected and ready to go. 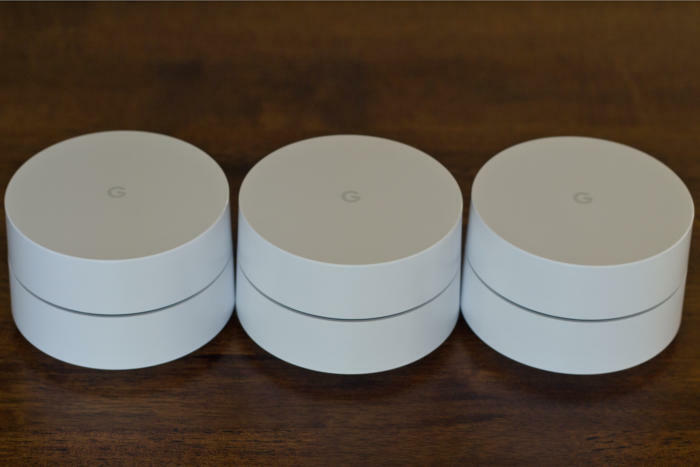 Google made a bunch of new hardware announcements earlier this year, which included...Google Wifi (love how they drop the hyphen and lowercase the F)...a wireless mesh platform to go up against...other startups like eero...Google Wifi is the update to its OnHub Wi-Fi platform...Google sent me a three-pack of the new system, which goes on sale to the general public today. Google Wifi...is a "mesh" network, where you have multiple units that...communicate with each other to provide a strong, fast Wi-Fi signal throughout your home instead of a single Wi-Fi router, which might not reach that...Wi-Fi dead zone...Most mesh WiFi systems are pretty expensive, but Google's is the cheapest by far. What makes Google Wifi special is its setup and maintenance...everything is done through a companion app, which allows just about anyone to set it up successfully. Maintenance...is automatic once it is set up. For example, Google Wifi scans available Wi-Fi channels every five minutes to ensure devices are...on the “clearest” channel. It also assists in choosing the best Wi-Fi band for your devices...That same feature also routes your device to the best access point ensuring a well-performing connection. The app...if it believes you might get a better Wi-Fi connection by moving the access point...will tell you, as well as alerts on whether it detects interference or other problems and how to fix them. Speaking of your kids, through the Google Wifi app, you can apply parental controls that pause their Wi-Fi devices, perhaps during dinner or homework time...you can employ Google Wifi to control such...connected devices as Philips Hue bulbs. On Google Wifi, you can pause multiple devices at the same time by grouping them together...The apps let you see which devices are tapping into the network and which devices might be currently paused...if you’re looking for a less expensive but...strong remedy for poky network connectivity, Google makes a compelling case. Coverage and reliability is great...Google Wifi passed my 48-hour stress test with flying colors. During the test I set it to transfer lots of data between multiple wireless clients...The Wifi did this without any disconnections. The system also had excellent signal hand off, allowing you to walk around your house...connecting from one unit to another without getting disconnected from the internet. I tried this while making a call over Wi-Fi and the conversation wasn't affected at all. In the end, you’ll have to figure out if it’s worth upgrading your...home Wi-Fi...Google’s product is convenient and easy to use, but its speed might not be the breakthrough that you’re hoping for...That said, from a...pricing perspective...Google Wifi does undercut the competition. Google has...a good first stab at improving home Wi-Fi, but not necessarily something everyone needs...it’s worth experimenting for yourself to figure out what’s best for your home. It's still up for debate whether these mesh networks are an absolute necessity for most consumers...but those who do choose to invest in one will likely appreciate the utility and ease of use. I'll...be adding Google Wifi to my holiday wish list. In addition to the Google Store, you can also purchase Google WiFi from Amazon, Best Buy, and...Walmart...One Google Wifi unit can be purchased for $129, or you can score a three-pack for $299. All retailers selling Google Wifi feature the exact same prices.